Properly Washing Your Dog to Keep Ticks Out of Your Home - Mummy's Gone Mad! | Mummy's Gone Mad! Keeping ticks out of your home starts with a good defense. The first line of defense is to use a service like Intensive Tick Treatment from the Mosquito Squad. Services like this help keep ticks at bay and away from your property. Your second line of defense is the proper bathing of your dog. When ticks attach to your dog, they eventually get carried into your home, where it’s easy for them to bite your loved ones and spread diseases. Here are a few tips to make sure you’re washing your dog properly to avoid ticks. Just like humans, the skin on dogs is sensitive to hot water. Before putting your dog into the bath, check the temperature of the water. It needs to be warm, but not hot. Cold water can easily give your dog the chills and can even be dangerous for puppies. After getting the temperature of the water right, it’s time to get started. Don’t apply the shampoo directly to your dog’s fur right away. Start by wetting the dog’s body. Note that washing the dog’s face and head is generally not recommended. Try using a cup or pitcher to pour water over your dog. This cup will also come in handy when it’s time to rinse. For best results, use a shampoo that offers tick and flea control. If your dog has really thick fur, mix the shampoo with a small amount of water to make covering its entire body easier. Once the shampoo is applied, gently massage it into the dog’s coat. Once again, don’t apply shampoo on the dog’s head. Getting its ears wet can promote infections. If you need to wash your dog’s head, just use a damp cloth to remove dirt. Pro tip: While lathering up your dog, use your hands to check for unusual signs such as inflammation or bumps. These could be areas of concern that you should talk with your veterinarian about during your next visit. After applying the shampoo, leave it on your dog’s body for as long as the product states. Some shampoos need longer to work, so it’s always important to check. You need to rinse your dog’s coat until to runs clean of all the shampoo. Use the cup or pitcher you used to wet the dog’s fur. Be sure that you rinse it thoroughly, because leftover shampoo residue can irritate a dog’s skin. That’s it! Your dog is now clean and protect from ticks. This process will have to be repeated as often as the shampoo calls for it to remain effective. 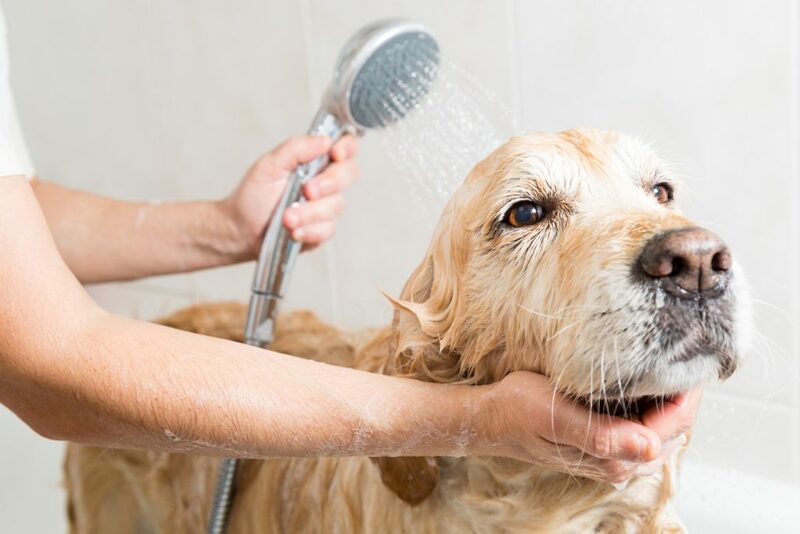 This typically involves washing your dog about once a month. It’s important to not over-wash your dog because its skin produces natural oils that are healthy for its fur coat.